Following the money: Where is Horsham’s cycling money actually going? You are here: Home / Featured / Following the money: Where is Horsham’s cycling money actually going? Cycling is good for us and good for our communities, but our local highways design process still ignores the needs of adults and children who want to cycle. Our roads are basically designed for cars and HGVs. 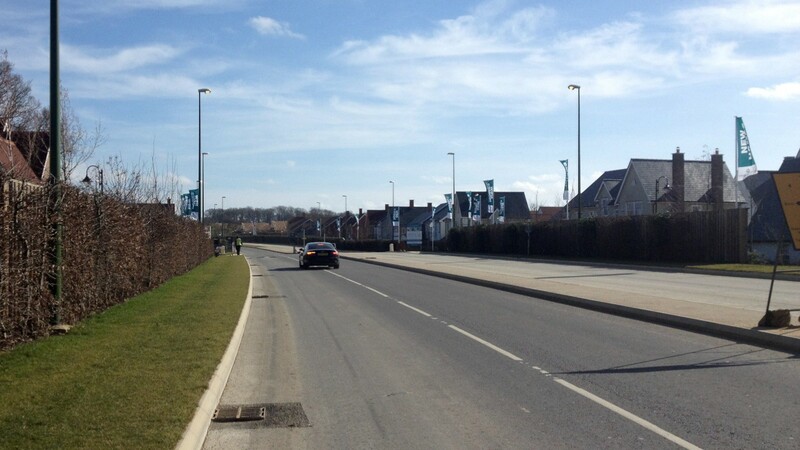 Cycling to the new West of Horsham houses will mean riding on this brand new 40mph dual carriageway, which has been built with no cycle tracks. To help make our roads fit for cycling, we rely on small sums from the ‘Sustainable Transport’ money that is dished out every now and then through various government schemes like the LSTF (Local Sustainable Transport Fund) and the Local Growth Fund. This money is precious, so surely we are squeezing every last drop of value out of it? The answer is a resounding ‘NO’. Even worse, we have discovered that millions of pounds are being syphoned off into schemes that have no sustainable transport benefits at all: schemes that sometimes actively worsen conditions for cycling. Even where the money is allocated for cycling, it is frittered away on leaflets, videos and maps. Where changes to the roads are planned, these are often whittled down until almost nothing is left – and the projects end up with massive underspends. In an attempt to plug the £14m black hole in the funding for the new West of Horsham housing development, WSCC applied for £2 million of sustainable transport money. The plan is to spend it on increasing motor vehicle capacity on the A264/A24 and also to add traffic calming – this is needed to prevent people rat-running through Broadbridge Heath instead of going the long way round on the new A264. Plan for increasing vehicle capacity by widening and signalising Farthings Hill. The shared-use paths will cross the 40mph junction in four stages. They finish abruptly rather than merging with the road. 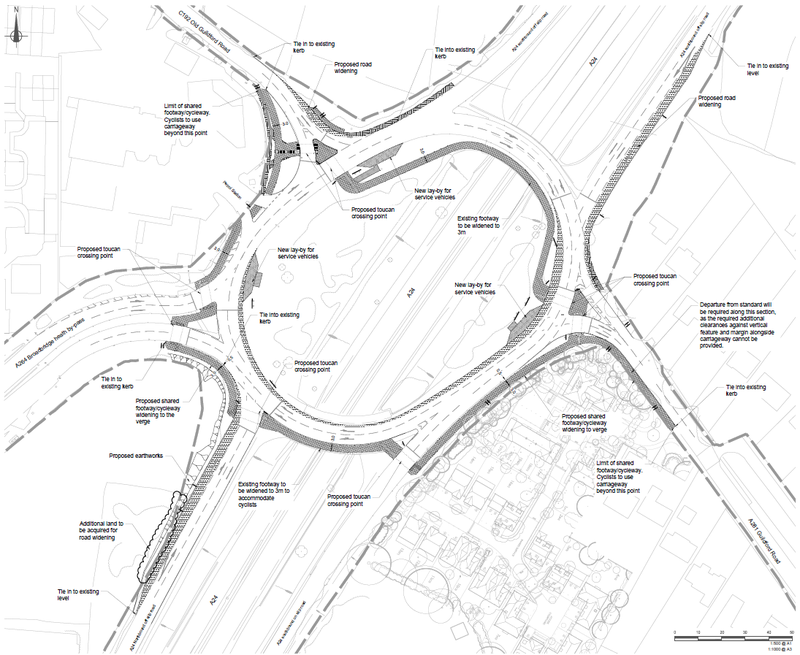 The old A264 Broadbridge Heath bypass will be down-graded, but will have a 40mph speed limit and no cycle tracks. 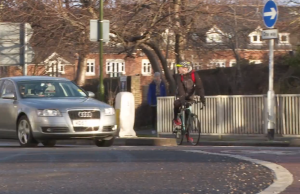 There are no new quiet cycle routes – indeed, the plan even includes breaking up parts of the road that cars will no longer need. 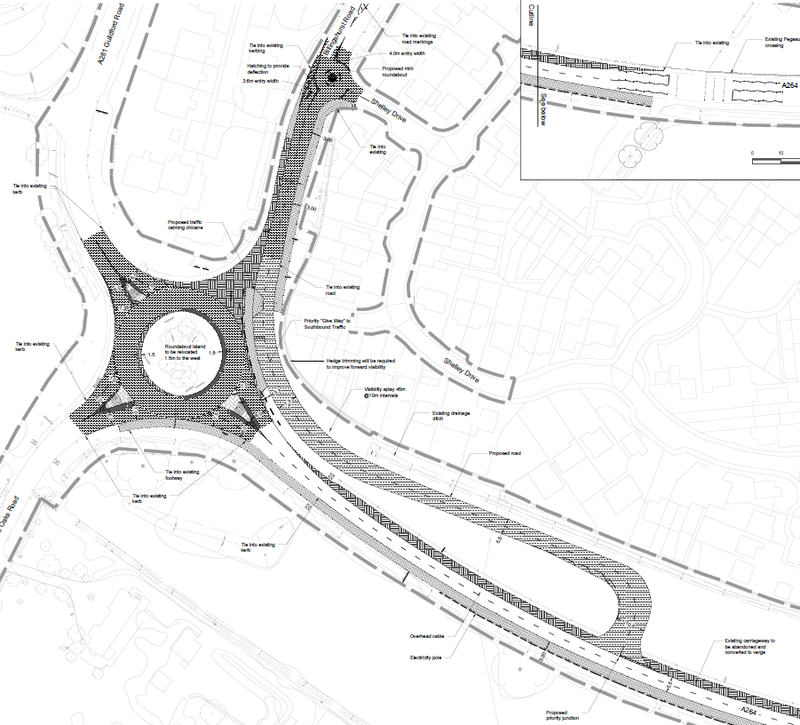 Certainly, cyclists will be able to cross Farthings Hill via four slow and unpleasant stages – but there is no link to safe cycle routes on either side of the roundabout, and this will still not be a route that most people would choose for themselves or their children. Overall, the package is bad for cycling (for full details see HDCF-Comments-West-of-Horsham-Transport-Package.pdf). Plan for Five Oaks roundabout: a new loop of road is added to discourage rat-running through Broadbridge Heath. Cyclists will be allowed to share the pavement, but this is unsatisfactory for people walking as well as for those cycling. WSCC was unable to quantify any benefits to people cycling or walking. At the recent Local Transport Body meeting, members agreed with the verdict of independent assessors that the business case for this scheme was flawed and that it did not meet any of the funding criteria. However, the LTB is looking for a way to fund it somehow – possibly by renaming the money so it no longer has any “sustainability” strings attached. If this happens, it will be the worst of all possible outcomes: not only will the hostile new roads harm cycling, but the opportunity to build £2m worth of genuine sustainable transport schemes will be lost. And having set a precedent, there is the danger that any future money will go the same way. The bid for this was made when WSCC still had a cycling officer; the original budget was £677,000 spread between four schemes, a significant proportion being for cycling infrastructure. The largest scheme is for an east-west cycle route across Horsham. Initial delight eroded as the cycle infrastructure elements of the scheme were progressively whittled away. Now there is almost nothing left from the original brief. Only £180,000 of the budgeted £320,000 is now expected to be spent. Of this, £30,000 has been used for cycle parking. Horsham certainly needs more cycle parking, but these are needlessly expensive cycle racks of an inappropriate design in poor locations. Further significant sums will go on consultancy, management, monitoring and producing a new bus/cycle map. 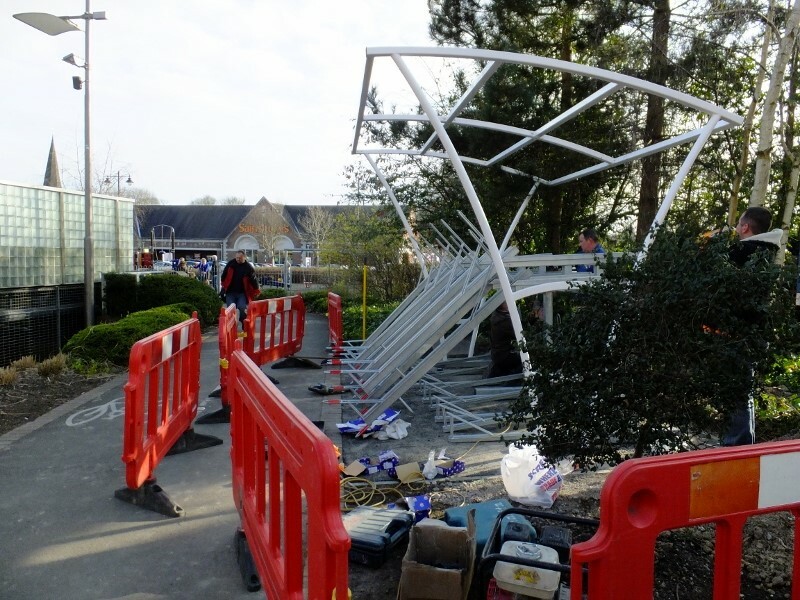 New cycle racks for Horsham – a poor choice of design for town centre use and placed in inconvenient locations. This leaves very little for construction of the actual route – which will not now start until after the official deadline for project completion has passed. 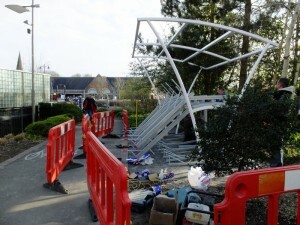 The Horsham station forecourt works, budgeted at £195,000 were mainly improvements for bus passengers. Much of that scheme has been dropped and the remaining work has been rebranded to emphasise the cycling provision, although the actual improvements for cycling are minimal and the design has created a dangerous new pinch point on the road. There is an estimated underspend of £102,000. The LSTF team thought there was £35,000 available to install more double decker cycle racks at the front of the station – where they are much needed. It appears that this money had already been spent on cycle racks at the rear of the station – possibly those which have now been removed to make space for another cycle parking scheme. Unlike the cycling money, the £127,000 allocated for increased motor vehicle capacity along Albion Way was fully spent. Much was made of a very minor part of this scheme: Advanced Stop Lines (ASLs) that were added for cyclists and a bus priority detector, but the ASLs don’t meet even minimum guidance and the butterfly detector loops installed to detect cycles (which were originally not even going to be put on all the junctions) don’t work properly. Money was wasted by painting the ASL boxes twice. At the beginning of March 2015 the total projected underspend was estimated at £242,000 – around 35% of the available budget. 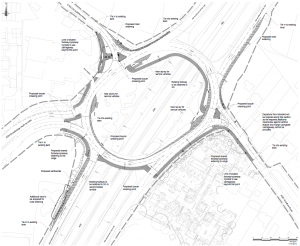 Apparently this money will now be spent in Chichester – although the recent news is that the flagship scheme on the Northgate gyratory has failed its safety audit and will revert back to virtually the same layout with the same safety problems as before. Chichester’s risky Northgate gyratory cycle lane: looking over the shoulder to check for traffic. The Worthing sustainable transport package, which has just been approved by the LTB turns out to be a public realm scheme (essentially repaving a shopping street) with no transport in it at all – another precious £1.2 million of money, intended to make walking and cycling safer and more convenient, which has now been lost. Millions of pounds are available through the highway budget, through developer contributions and designated sustainable transport funds, but when you follow the money it’s just not going into cycle infrastructure. The issue is not a lack of funding but rather a failure to prioritise, or even to recognise, cycling as a serious form of transport. All the money and time being wasted, it’s a disgrace. The councillors need to be taken to task over this.